In Williams Bay, Wis., summer is all about live entertainment on the shores of Geneva Lake. George Williams College of Aurora University hosts its 16th annual Music by the Lake outdoor entertainment series on weekends from June 26 through Aug. 20. The lineup includes dancing, Broadway music, classical performances, star vocalists and interactive family shows. 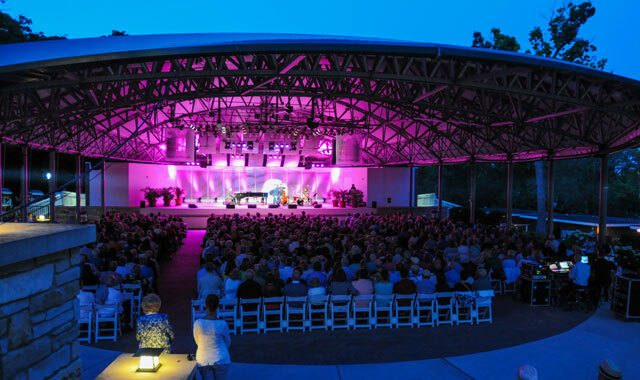 All performances occur rain or shine at Ferro Pavilion, 350 Constance Blvd., Williams Bay, Wis.
It’s common for Russe to see groups of friends attending Music by the Lake, in addition to families spanning two to three generations. As the person who plans and books the season, Russe is proud to offer numerous opportunities for locals and visitors alike to enjoy the greater Geneva Lake area. The series begins Sunday, June 26, with an afternoon of summer waltz music, featuring The Lake Geneva Symphony Orchestra and dancers from Delavan’s Dance Factory. Guests who are inspired to learn basic steps can take free waltz lessons with Dance Factory instructors prior to the performance. The program includes Johan Strauss Jr.’s “Takes from the Vienna Woods” and “The Blue Danube,” as well as works by Lehar, Mahler and Tchaikovsky. Micky Dolenz amps up the crowd on Saturday, July 9, with a dynamic string of chart-busting hits such as “I’m a Believer” and “Take the Last Train to Clarksville.” The drummer and vocalist behind The Monkees helped to turn out five platinum albums and three No. 1 hits by 1968. This summer marks the 50th anniversary of The Monkees’ television series and release of their debut single. On Saturday, July 16, YouTube sensation Postmodern Jukebox performs genre-bending interpretations of today’s big hits. Postmodern Jukebox is the brainchild of pianist and arranger Scott Bradlee, who began to test his musical creativity by rewriting 1980s pop tunes as jazz, swing and ragtime arrangements. Bradlee gained popularity after posting solo video performances of these remakes on YouTube in 2009. Today, 160 videos later, Bradlee and a revolving cast of 50 musicians have attracted 1.9 million subscribers and more than 400 million views. For family-friendly fun, catch television stars Rich, Scott, Dave and Smitty from “Imagination Movers” on Sunday, Aug. 7. The high-energy, interactive performers are best known for their Emmy Award-winning series on the Disney Junior channel. The Movers have captured audiences in 55 countries with catchy pop-influenced tunes from their nine albums. The Chicago Philharmonic is a collective of more than 200 of the highest-level classical musicians performing in the Chicago area. Hammerstein’s grandson, Oscar Andy Hammerstein III, has devoted much of his life to studying and preserving his family’s heritage and will host the Williams Bay show. “It’ll be a very special evening,” Russe says. Closing this year’s series on Aug. 20 is the all-male vocal phenomenon Straight No Chaser. The a cappella group began more than a dozen years ago at Indiana University and since has reassembled and re-emerged with a sound capturing more than 20 million views on YouTube. The group’s sense of humor is also known to be an enjoyable component of their performances. Russe believes Music by the Lake provides a culturally enriching experience for those who attend, regardless of whether it’s one event or all six. To her, art is more than just important – it’s critical to embrace. Tickets for all Music by the Lake performances are available at musicbythelake.com or by calling (262) 245-8501. This entry was posted on Wednesday, June 29th, 2016 at 11:59 am	and is filed under Arts & Entertainment. You can follow any responses to this entry through the RSS 2.0 feed. Both comments and pings are currently closed.